There are over 1600 ETFs right now, with more in registration. This explosion of alternatives is great for driving down fees and giving investors choices. However once we figure out what we want to buy, we often discover the fund we chose is lightly traded—perhaps only hundreds of shares are traded on any given day. With a lightly traded fund the bid/ask spread is usually significantly wider than the one cent spreads we see with the big ETF funds and stocks. 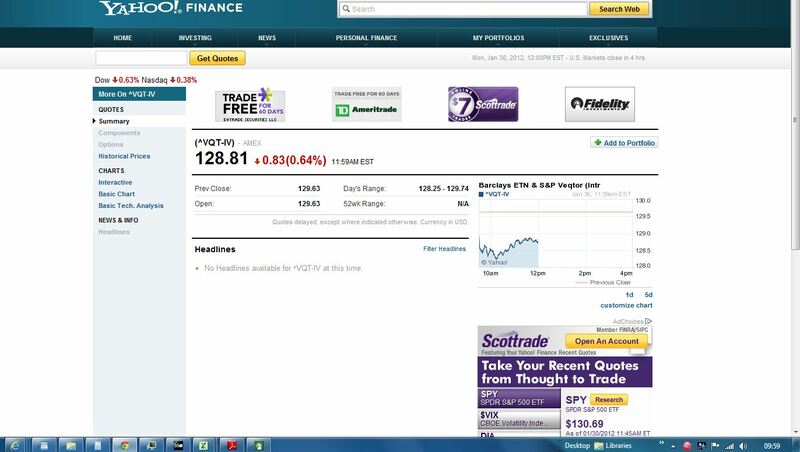 The thumbnail below (click to enlarge) is from Fidelity Active Pro’s order book of Barclays’ VQT in early 2012. At that point it had almost $200 million in assets under management—but its Level 2 order book was still ugly. The best quoted bid/ask spread is $0.08—not great but only a 0.06% hit on the overall value of the trade. However, those quotes are only for 100 shares. For 200 shares the spread widens to $0.44, and for 1000 shares the visible book widens to 125/129.54—a chilling $4.54 spread. If someone was careless enough to enter a market order to sell 1000 shares the likely result would an average price of 126.86—1.5% lower than the best bid price. It’s possible that a market maker would step in to prevent this sort of carnage but I doubt it. Which brings us to rule #1: Always use limit orders unless the security you are trading has narrow spreads and deep liquidity. However things are not nearly as grim as they seem. Unlike stocks, ETFs have built in processes to provide liquidity when needed. This share creation / redemption process enables companies designated as Authorized Participants (APs) to routinely respond to the market’s demand/disdain for ETFs shares in 50K+ share increments. For example, if market forces are causing a ETF’s price to drift higher than its intraday net asset value (iNAV), then an AP can step in and execute a profitable, essentially risk free arbitrage transaction that creates more shares. The AP (and the ETF) are happy to create shares until the increased supply has driven the market price down close to the iNAV value. The reverse situation, with the ETF price below the iNAV is also profitable for the AP to correct by redeeming shares. This brings us to rule #2: Know what the IV / iNAV value of your ETF/ETN before you trade. The IV or iNAV value is available on Yahoo Finance by adding a “^” to the beginning of the symbol, and a “-IV” to the end. For example the iNAV symbol for VQT, is ^VQT-IV. On Bloomberg add IV:IND to the end of the symbol to get, VQTIV:IND. For Schwab, start with $ and end with .iv , $SPY.IV. For Fidelity add /IV, for example: VQT/IV. See the thumbnail below for an example iNAV quote. You will probably won’t be able to buy or sell at the iNAV price, but you should be able to get close. Knowing the iNAV value will help you recognize if the market is out of balance. Normally the iNAV will be close to the middle of the bid/ask spread—if not be especially careful. If your trade is going to be large (e.g., 10,000 or more shares) you should work with liquidity providers like Wolverine, KCG Holdings, or Wallachbeth to see if they can facilitate your trade. 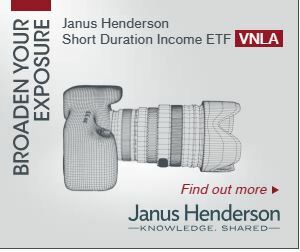 These firms can provide great quotes for even million share transactions on lightly traded ETFs, see this excellent webcast from ETF.com for some demos. This post gives an nice overview of the institutional landscape for trading ETFs. If your trade is small, say 100 shares or less, then a limit order should be fine. If you want to score a few pennies on the spread you can try placing your order between the bid/ask price and see if it fills. If it doesn’t execute you can cancel your order and improve your offer until it does complete. For larger orders things get a bit trickier. I’ve tried “all or none” limit orders without much success. What has worked for me is a limit order set within the bid/ask price, biased a few cents in the market maker’s favor. If I’ve specified a good limit price I will see partial fills in 100 share blocks over the span of a minute or two until the order is complete. You only pay your commission once, assuming the order completes within the trading day. Of course there are risks to this; the market might move against you, or liquidity might be exhausted, but compared to the risk of a lousy price these are good risks to take. And rule #3: Even lightly traded ETFs typically have good liquidity, but it’s your job to coax it out.